(This update: November 12 at 3 pm). We highlight NEW/CHANGES/UPDATES. This is a work in progress. Items added in the past few days are marked “NEW.” If you are scheduling or changing events, please try to contact other group(s) on your target date to minimize overlap and conflicting events. We encourage organizers to take video, and provide live or later on Livestream or YouTube, to help you multiply your audience and impact. It also serves as useful material to hold candidates accountable later. Please send new info and corrections to us at citizenYVR@gmail.com. (We do our best to check facts, but cannot guarantee being 100% up to date/correct. We also urge you to check with organizers as required.) See also My Vote Matters. COMPLETED: Vancouver Board of Trade discussion with Mayoral Candidate: Kirk LaPointe, Non-Partisan Association (NPA). COMPLETED: Christ Church Cathedral, Mayoral Debate, Sunday, October 26, 1:30 – 3:30 pm. Christ Church Cathedral (Burrard and Georgia). Who: Bob Kasting (independent), Kirk LaPointe (NPA), Gregor Robertson (Vision Vancouver), Meena Wong (COPE). COMPLETED: Shaw TV Channel 4 – Decision 2014 – Mayoral Debates Televised – Shaw TV is holding televised mayoral debates for 14 municipalities in the Metro Vancouver region. Each debate is broadcast twice. 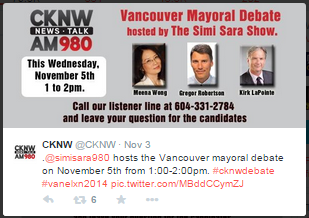 Vancouver gets two debates. COMPLETED: Mingpao, OMNI, and AM1320 — Saturday, November 1, 2014. 2 – 4 pm. Mayoral Debate. First come first serve seating. Debate will be in Cantonese & English. Venue: Chinatown Plaza, 180 Keefer Street. This event will not be webcast. But it will be broadcast in full the following week on AM1320 radio, plus there will be coverage on @OMNInewsBC and Ming Pao Chinese newspaper on Monday November 2. COMPLETED: Simon Fraser University and the Vancouver Sun, Tuesday, November 4, 2014. 7:00 – 8:30 pm. Mayoral Debate. SFU Harbour Centre. Arrive early — seats limited! Candidates: Bob Kasting (Independent), Kirk LaPointe (Non-Partisan Association), Mayor Gregor Robertson (Vision Vancouver) and Meena Wong (COPE). Panellists Maureen Maloney (professor, SFU School of Public Policy), Jeff Lee (Vancouver Sun City Hall reporter). Moderator: Vancouver Sun Editor-in-Chief Harold Munro. 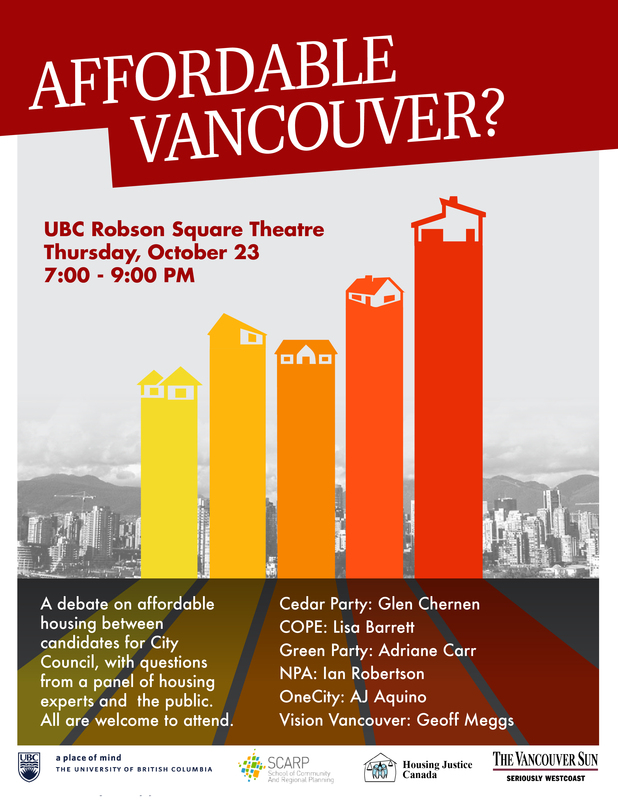 http://www.sfu.ca/publicsquare/upcoming-events/mayoral-debate.html. Free. Read Jak King’s post-debate review: http://jaksview3.wordpress.com/2014/11/05/choosing-the-mayor/. Adriane Carr, Green Party: Monday, Oct. 6 at 12:00 p.m. Click to view. Bob Kasting, Independent: Tuesday, Oct. 7 at 10:00 a.m. Click to view. Meena Wong, COPE: Tuesday, Oct. 7, 12:00 p.m. Click to view. Kirk LaPointe, NPA: Wednesday, Oct. 8 at 12:00 p.m. Click to view. 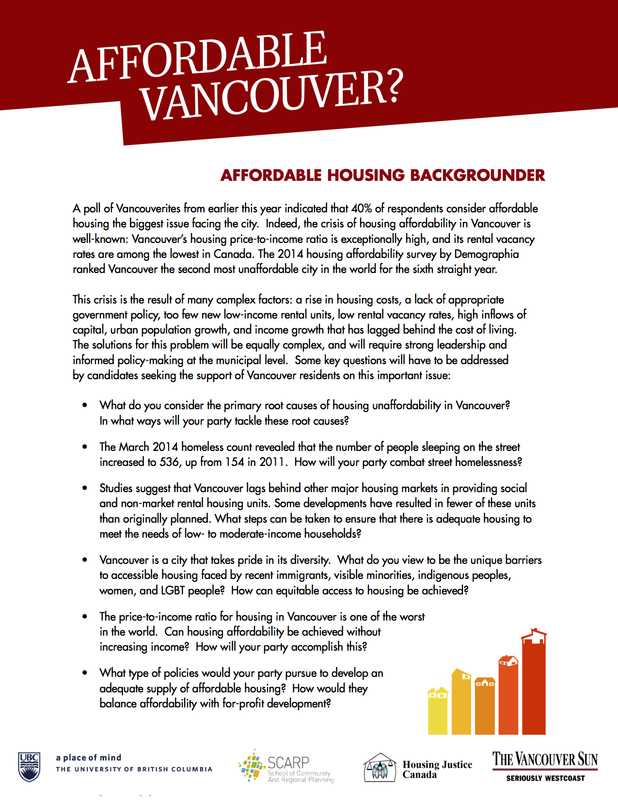 Mayor Gregor Robertson, Vision Vancouver: Thursday, Oct. 9 at 12:00 p.m. Click to view. COMPLETED: Alliance for Arts and Culture and SFU Woodward’s Cultural Unit — Friday September 26, 9:30 am. SFU Woodward’s, “Reverse Debate” (Each municipal party running candidates for Council invited to submit a question and send one representative). 149 West Hastings Street. COMPLETED: City Conversations, presented by SFU Public Square. Thursday, October 2, 12:30-1:30 pm, Young Politicians: Meet Vancouver’s New Generation of Leaders. Room 2270 at SFU Harbour Centre. Guests Coree Tull (Vision Vancouver, candidate for Park Board), RJ Aquino (OneCity candidate, for City Council), and another youthful candidate. Free. Sponsored by Bing Thom Architects, The City Program, and SFU Vancouver. COMPLETED: Metro Vancouver Alliance – Thursday, October 9, 7- 9pm, Municipal Election Accountability Assembly. Italian Cultural Centre, 3075 Slocan Street. Delegations from 49 member organizations, representing 200,000 citizens, will ask politicians to commit to MVA’s proposals on housing, transit, poverty, social isolation. About 1,000 people expected. Prep workshop details here. Organizers will take video of the event. Check website (www.metvanalliance.org) later for links to the eventual YouTube video. 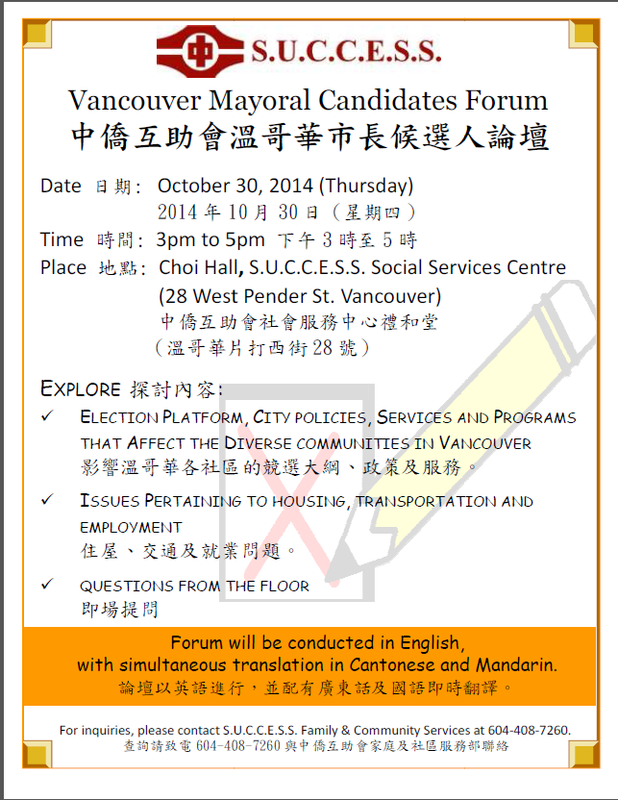 COMPLETED: Marpole Residents Coalition – Sunday, October 19, 2 – 4 pm, Vancouver Council & Park Board candidates’ forum. Marpole/Oakridge Community Centre (gym) 990 W 59th Ave @ Oak Street. Moderator-led town-hall style debate on issues that affect Marpole residents. Six Council and six Park Board candidates (from Cedar Party, COPE, Green Party, NPA, Vancouver First, and Vision Vancouver) have committed to attend and answer pre-set questions and questions from the floor. COMPLETED: Residents Association Mount Pleasant (RAMP) – Monday, October 20, 6:45 – 9pm, for City Council candidates. 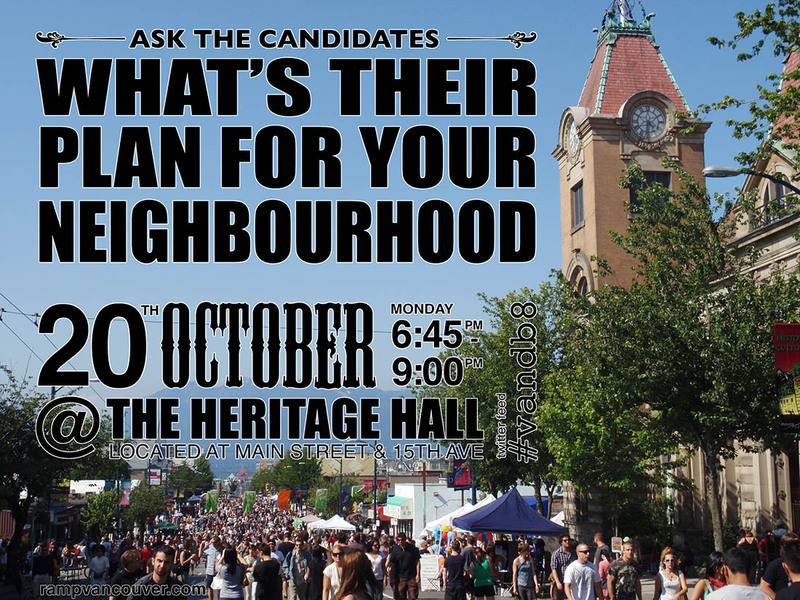 Debate on planning & neighbourhood issues, Heritage Hall (Main Street and East 15th Ave). The debate will be moderated by Miranda Nelson of the Straight. Participants: Heather Deal & Raymond Louie (Vision Vancouver), George Affleck & Ken Low (NPA), Adriane Carr & Pete Fry (Green Party), Tim Louis & Keith Higgins (COPE) and Nicholas Chernen (Cedar Party). Questions for the first half of the debate will be crowd-sourced (via email); there will be an open microphone to take questions from the audience in the second half. COMPLETED: Langara College, with GlobalBC- Wednesday October 22, 3:30 – 5:30 pm, Mayoral debate. Participants: Bob Kasting (Independent), Kirk LaPointe (NPA), Gregor Robertson (Vision Vancouver), Colin Shandler (Independent), Meena Wong (COPE). Moderated by Globe and Mail reporter Gary Mason. Will be live-streamed on web. SOLD OUT. 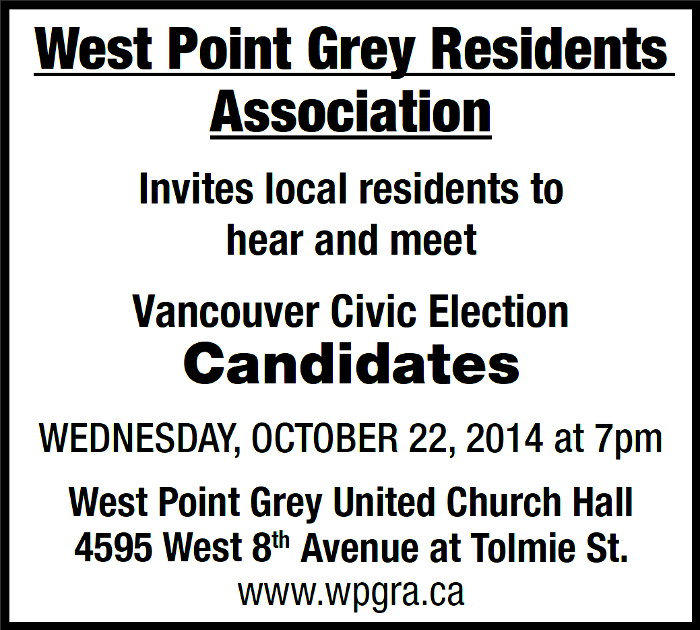 COMPLETED: West Point Grey Residents Association – Wednesday, October 22, 7 pm start. West Point Grey United Church, West 8th & Tolmie — to be confirmed. http://wpgra.wordpress.com/ Topics will include Jericho Lands, UBC, transit and development. Moderator: Bob Mackin, a journalist who has reported for local, national and international media outlets since he began in 1990. COMPLETED: Carnegie Community Centre Association – Thurs. October 23 – 2 – 4 pm. Downtown Eastside All-Candidates Meeting. Location: Carnegie Theatre (401 Main St.) – https://www.facebook.com/events/1402275890019044. Submit a question to envelope on bulletin board on second floor. Confirmed candidates (parties that have had candidates in office during last 3 elections). COPE Audrey Siegl sχɬemtəna:t and Sid Chow Tan 周明輝, Green Party of Vancouver: Adriane Carr and Pete DG Fry, Vision Vancouver: Andrea Reimer and Niki Sharma, Vancouver Non Partisan Association (NPA): Suzanne Scott. Other parties and independents: Nicholas Chernen, Cedar Party. Anthony Guitar, Independent. Ferdinand Ramos, Hotel Workers United, Local 40. COMPLETED: Killarney Community Centre Society– Thursday, October 23, 7:00 – 9:30 pm, for Park Board Commissioners, Killarney Community Centre, 6260 Killarney Street. COMPLETED: Strathcona Business Improvement Association (BIA) jointly with Groundswell/Hastings Crossing BIA. Thursday, October 23, 7 – 9 pm. All Candidates’ Meeting. Groundswell 566 Powell Street. COMPLETED: Cedar Cottage Neighbourhood House All-Candidates Meeting. Saturday, October 25, 9am – noon (panel 10 – 11am). 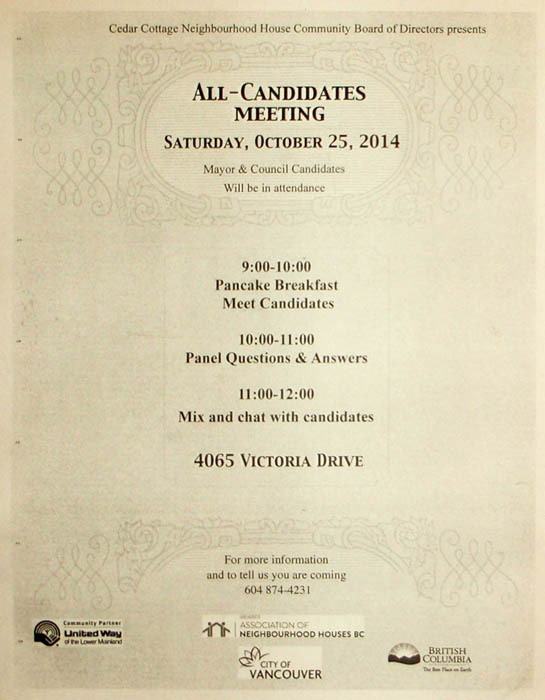 Pancake Breakfast (9 – 10am), Panel Questions & Answers (10 – 11am), Mix and chat with candidates (11am – noon). 4065 Victoria Drive. RSVP to 604 874-4231. COMPLETED: Dunbar Residents Association – Monday, October 27, 7-9 pm. All candidates. St. Phillips Church, 3737 West 27th Avenue. COMPLETED: Kerrisdale Community Centre Association – Monday, October 27, 7 – 9 pm. For City Councillors, Kerrisdale Community Centre, 5851 West Boulevard. COMPLETED: University Women’s Club Tuesday — Tuesday, October 28, 7 – 9 pm. Election Forum at Hycroft — Forum for Mayoral and Women Candidates for Council. Hycroft Manor,1489 MacRae Ave. http://www.uwcvancouver.ca/. COMPLETED: Strathcona Community Centre Association — Tuesday, October 28, 7 pm. 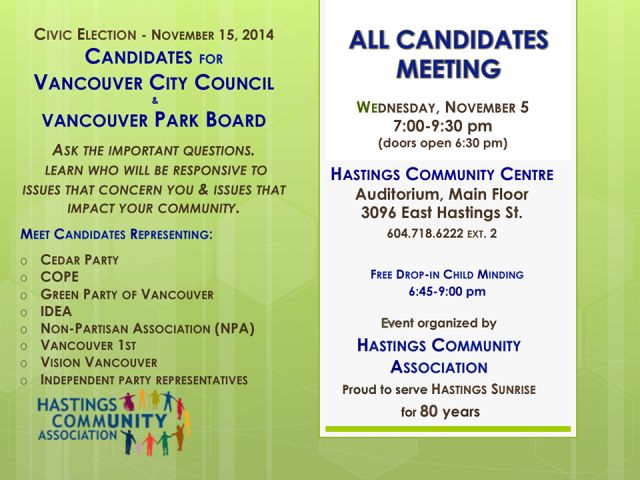 Dialogue/debate for Park Board candidates. All parties invited. Focus is issues facing community including equity, facilities and planning for density and neighbourhood change. COMPLETED: Kensington Community Centre Association – Tuesday, October 28, 7 – 9 pm. Debate for Park Board Commissioners. Location: 5175 Dumfries (Community Hall). Facebook page for event: https://www.facebook.com/events/671696176270997/. COMPLETED: Vancouver Public Space Network, Sunday, November 2, 12 – 5 pm. Last Candidate Standing event. 149 West Hastings Street. (http://vancouverpublicspace.ca/) Attention candidates! Nominees for Mayor and Council are asked to confirm their participation in Last Candidate Standing by contacting jessica [at] vancouverpublicspace [dot] ca. Produced by VPSN with support of SFU’s Vancity Office of Community Engagement and the Urbanarium Society. Event is FREE but space limited – Pre-register: Eventbrite page. More info Facebook event page or http://vancouverpublicspace.ca/events/last-candidate-standing/. COMPLETED: Kerrisdale Community Centre Association – Sunday November 2, 2 – 4 pm. For Park Board Commissioners, Kerrisdale Community Centre, 5851 West Boulevard. COMPLETED: Vancouver Council of Women — Monday, November 3, 12 noon. Unitarian Church Hall (49th and Oak). ADVANCE VOTING STARTS November 4 and goes to November 12 (excluding November 11) from 8:00am to 8:00pm. Info here. COMPLETED: Kensington Community Centre Association – Tuesday, November 4, 7 – 9 pm. Debate for City Councillors. Location: 5175 Dumfries (Community Hall). COMPLETED: Safe Amplification Site Society — Wednesday, November 5, 7 – 10 pm, All Candidates Meeting, at Astorino’s (1739 Venables St). COMPLETED: Shaughnessy Heights Property Owners Association (SHPOA) — Thursday, November 6, 7 pm. All Candidates Meeting. Hellenic Community Centre, 4500 Arbutus Street. www.shpoa.ca. (Formerly was set for Oct 29). COMPLETED: West End! Saturday, November 8, 2 – 4 pm. West End Candidates’ Debate (Council/Park/School Board). Two candidates per party (particularly candidates who are West End residents). Venue: Gordon Neighbourhood House. Some topics: West End Community Plan, Proposed Demolition & Redevelopment of the Aquatic Centre, Community Centre Joint Operating Agreements, Lack of affordability. NEW: West End All Candidates Meeting, Wednesday, November 12th, 7pm to 9pm. All West End Candidates Meeting. Venue: St. Paul’s Anglican Church (1130 Jervis and Pendrell) Neutral non-partisan meeting not affiliated with any group. 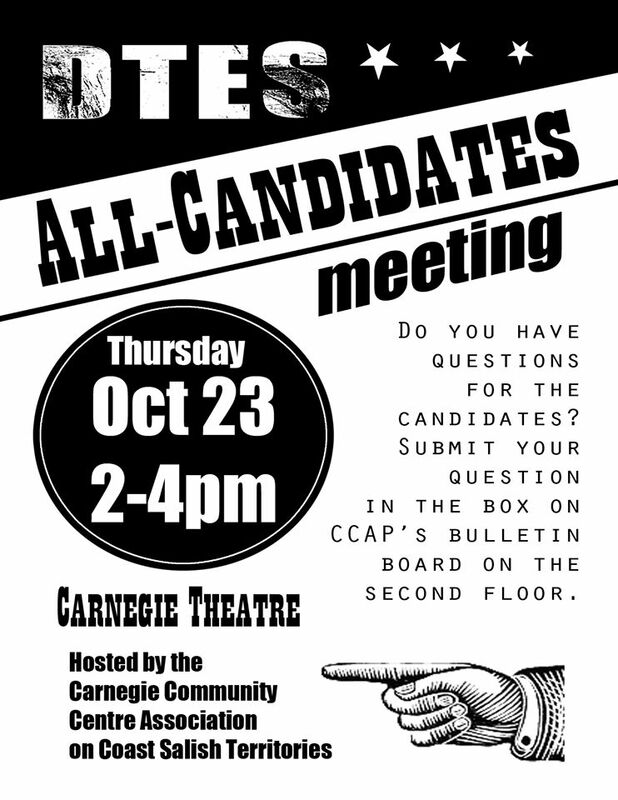 Meeting Format: 7:00 PM, one hour of key questions for candidates. 8:00 PM, one hour open microphone questions from residents. Some topics – Security of rental housing tenure, Community plan implementation, Transportation challenges, Capital spending for West End amenity upgrades. 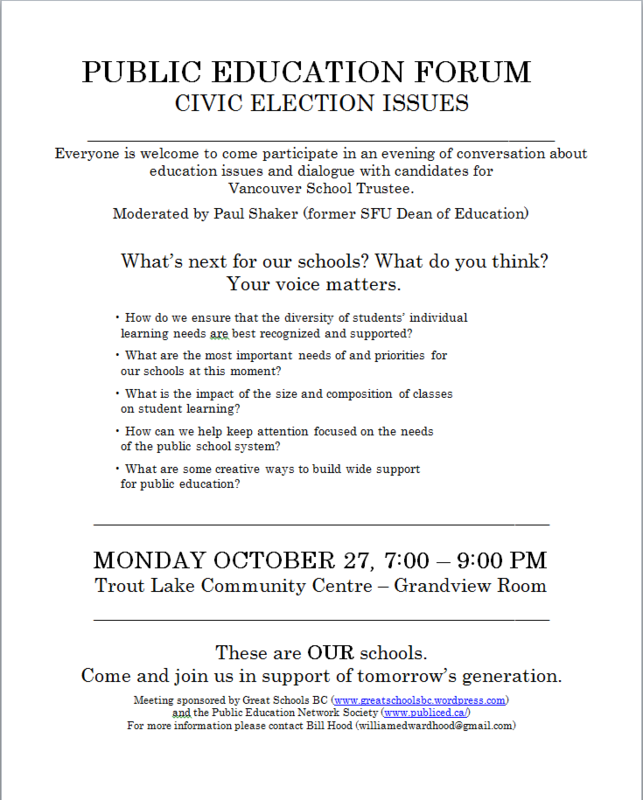 NEW: UBC (presented by the Pre-Education Club) Vancouver (School District 39) School Board Trustee Forum / Meet and Greet. Wed, November 12th, 4 – 5:30 pm. Where: University of British Columbia, Student Union Building, AMS Art Gallery, 6138 Student Union Blvd, UBC. Description: Final format will depend on the number of candidate attendees: a forum with personal introduction and priorities, general questions from the moderator and questions from the attending audience followed by meet and greet. CBC radio and television – No official announcement, but word is trickling out that this will be recorded in studio on Wednesday, November 12. NOTE THAT ELECTION DAY IS NOVEMBER 15. Info here. On November 7, 2011, St. Andrew’s Wesley United Church held a mayoral debate on Homelessness and Affordable Housing (Robertson vs Anton), attended by about 700 people. CityHallWatch has confirmed that they do not plan to do so in 2014. Again I am hoping to contact your site to post a link to an upcoming School Board election related event. The event will involve candidates for School Trustee and is on Monday Oct. 27 at Trout Lake Community Centre.